CensorSweeper allows users to test their net connection for censored sites, just using an unmodified web browser. A Safari front-end for Collusion, a browser addon that provides an interactive, real-time visualization of the entities that track your behavior as you surf the web. GlobaLeaks is the first open-source whistleblowing framework. It empowers anyone to easily set up and maintain a whistleblowing platform. GlobaLeaks can help many different types of users: media organizations, activist groups, corporations and public agencies. MobileScope allows mobile devices to access privacy and security features that are normally only available to "jailbroken" phones. Ostel is a tool for having end-to-end encrypted phone calls. Our goal is to promote the use of free, open protocols, standards and software, to power end-to-end secure voice communications on mobile devices, as well as with desktop computers. Pestagram takes information from one site - the intimate, emotional, mobile Instagram and presents it with the context of Pinterest - the public, aspirational, image packrat site to illustrate the ease with which information and data associated with your person can be used for other unintended circumstances. PrivacyBucket is a Chrome extension that measures the extent to which individual third-party trackers can discover demographic information about the user. A tool for website owners and developers to ensure their site manages private data appropriately and effectively: PrivacyScanner. Users put in a URL, and we provide a report of the site partners' data collection activity, in multiple views. We provide a score for how well the site adheres to privacy best practices, and offer specific recommendations to improve the site. Priveazy aims to be a free one-stop resource for showing people exactly what they can do to protect their online privacy and protect the security of their devices and online accounts. Site Scoper analyzes a website for tracking, cookies and analytics before you visit so you know what information would be gathered. In the past, only technically adept users were able to discover the existence of third-party tracking tools on sites they visited or whether these sites honored opt-out and Do Not Track requests, though research has shown that this is a widespread concern in the total online population. TrackingCookie.info provides a browser extension that immediately shows users this information in a visual and easy-to-read format, collated from a new and automated data structure. service serving as a independent, transparent intermediator between social data and the apps that want to use them. 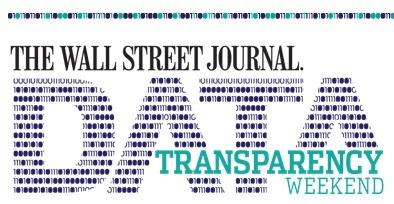 Tools put together at The Wall Street Journal Data Transparency Weekend event in New York on April 13-15, 2012. These tools focus around privacy, security and data transparency. A Firefox extension (add-on SDK) that tracks which sites you go to, what data you submit where and gives you a "quantified-self" view into your browsing habits.